Here are some headlines found on Fox News today. Social Security benefits for illegal immigrants? UN scolds US on record of “torture” and police brutality. I wonder, does the “land of the free” exist any more? I subscribe to the RushBabe49 Properly Grateful Theory of Life. Often throughout the year, I stop and think about how fortunate I am to live in this Greatest Nation on God’s Green Earth. By the accident of birth, I had upper-middle-class parents, in one of the most beautiful parts of this country (Pacific Northwest). I grew up in the 1950’s and 1960’s, got a good education, and managed to make my own way in the world, even though via a somewhat twisty path. So now I’m 65, gainfully employed at a job and a company that I like, married to a great guy who’s also a musician, own my home free and clear, have a really cute, fun kitty, and play in a community orchestra. I have always been quite attentive to my surroundings, and like to watch the sky, and the back yard bird-feeder. Stopping to smell the roses is second nature to me. New friends (and old) from Ricochet. In-person meetups are just wonderful, since sometimes we conservatives feel like we’re all alone out here in the deep-blue wilderness. In my humble opinion, the people of Ricochet are simply the cream of the cream of humanity, and I am humbled to be a member. Evergreen Community Orchestra, and our new conductor. We have our concert next Tuesday, and our Polish conductor brought a fun Polish Christmas carol for us to play. Here it is, “Bog sie Rodzi” (God is Born). My health. In spite of having a chronic disease, I’m still remarkably healthy, and it’s been nearly four years since I have called in sick to work. My wonderful doctors are a big help, too; my rheumatologist and my nephrologist both won “patients’ choice” awards at our clinic. My husband, who supports me through thick and thin. He also vacuums, cleans his own bathroom, and does his own laundry. And he loves to go shopping! My investments have done pretty well this year, in spite of the volatility in the stock market. They tell you to sell your losers at the end of the year, so you have losses to cancel out your gains. Well, I’m in the enviable position of having no losers! Every single stock and mutual fund I own has gains. Rush Limbaugh, who has again helped me to retain my sanity, in a time when average people are increasingly beleaguered by high taxes, cancelled medical insurance policies, higher deductibles on the policies you keep, government agencies thwarting an economy that should be recovering, and a president who has been acting like a king. Listening to the daily podcast on my iPod at work goes a long way to help me understand the crap being dished out daily. My country, which is still the very best on Earth. And, finally, this here blog! I have gained followers, had interesting conversations, and added some new features that have, by and large, improved the experience for me and my readers. So when you sit down to your Thanksgiving dinner tomorrow, be sure to thank God, who motivated the Pilgrims and the Founding Fathers. They began the most remarkable country in the entire history of humanity, founded upon an idea, the idea of individual human dignity, and Liberty. This country has allowed its citizens to become the most prosperous and free nation ever! Don’t ever forget that. The following post is on the Main Feed at Ricochet.com, by Contributor Stephen Miller. It needs to be read by EVERYONE! I have wondered for at least six years why they haven’t done this before. With the crap that has been going down, and been ignored by the mainstream media (“Grubergate”, Benghazi, immigration), it is long past time for the Republican Party to start fighting dirtier. Once they take control of Congress in January, they will have their hands full fully investigating the IRS scandal, tearing down the “Affordable” Care Act, and reversing the profoundly illegal immigration policies of the OTL administration. They do not need the power of the press against them too. Time to turn the RNC into a bulldog, instead of a poodle. This recent move by Pope Francis concerns me. Since Jorge Bergoglio was elected Pope, much has been written about his leftist leanings. His writings have indicated that he is open to relaxing some Church strictures on marriage (in favor of Communion for divorced or cohabiting people) and homosexuality (playing down the strictures against homosexual behavior). He has intimated that he thinks Capitalism mitigates against helping the poor, and that governments can mandate that their citizens pay higher taxes to support the poor. In the recent conclave at the Vatican, an American Cardinal, Raymond Burke conveyed that he thought some of the new ideas were bad for the Church. For his troubles, that Cardinal has been demoted in Rome. I just hope this dustup is not an indication that the Catholic Church, the oldest surviving institution in the history of mankind, is losing its way. I would welcome any comments by any of my Followers about this issue. I am ready to be informed and enlightened. P.S. Guaranteed way of getting lots of comments on a Ricochet.com post: Put Catholic in the title. You start it, and they run with it. Thanks to a fellow Ricochet member for this. I think it’s perfect! I believe that I have a useful tactic for opposing Obama’s executive amnesty, and I am trying to make the suggestion to influential people. I think that either the Congressional leadership or influential Senators should just announce to the public the Congressional intention that anyone accepting documentation under Obama’s illegal executive amnesty will be forever barred from a chance at legal immigration. Since Obama doesn’t intend to enforce the law by deportations anyway, the effect of a Congressional declaration would be to make Obama’s offer an unnecessary risk to any illegal alien considering applying for the documentation and effectively cause the program to collapse. The Congress can make the threat as part of a broader argument that it cannot allow an illegal executive act to stand. Anyway, I think that the strategy would kill the amnesty plan. I encourage you to promote it, too. 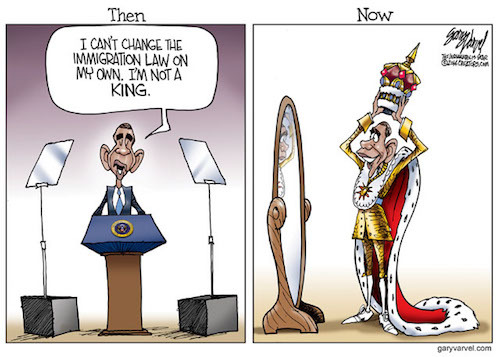 Obama has been speaking not to congress but to illegal aliens and their enablers in America, and the congress can only oppose him and prevent the action by speaking to exactly the same groups and changing the way that they evaluate their options. The leadership needs to make illegal aliens and their enablers think that their only chance for real legal status lay in shunning the offer of executive amnesty and reaching an agreement in the Congress.